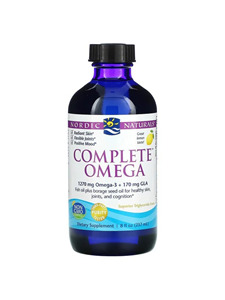 Complete Omega 3-6-9 is a blend of Fish, and Borage Oils. This combination of well-known nutritional oils provides a unique balance of Omega-3 and Omega-6 Essential Fatty Acids plus Omega-9, a non-essential, but beneficial fatty acid. The Omega-3's, Alpha Linolenic Acid, EPA and DHA, and the Omega-6, GLA, are necessary for the maintenance of cardiovascular, nervous system and skin health. Oleic Acid, an Omega-9, has also been shown to promote a healthy vascular system. The Natural Fish Oil Concentrate used in this softgel is manufactured under strict quality control standards. It is tested to be free of potentially harmful levels of contaminants (i.e. mercury, heavy metals, PCB's, dioxins, and other contaminants). One teaspoon daily, with food, or as directed by your health care professional or pharmacist. Less than 5 mg of Cholesterol per serving. Purified deep sea fish oil (from anchovies and sardines), borage oil, natural lemon flavor, d-alpha tocopherol, rosemary extract. Contains vitamin E derived from refined soybean oil. No gluten, milk derivatives or artificial colors or flavors. Consult with your physician before using this product if you are allergic to iodine, use blood thinners, or anticipate surgery. Q. What is the relevance of balancing the omega-6:omega-3 ratio? A. Over the past 100 years, changes in the food supply in Western nations have altered the type of dietary fatty acids we consume, leading to a dramatic increase in the ratio of omega-6 to omega-3 fatty acids. This increased omega-6:omega-3 ratio is known to influence inflammatory responses, contributing to higher incidences of many chronic diseases. To address this omega-6:omega-3 imbalance, current recommendations suggest increasing the consumption of pre-formed omega-3s EPA and DHA in fish and/or fish oils, increasing intake of ALA (an omega-3 alpha-linolenic acid found in vegetables, flax, fruits) and decreasing intake of LA (the omega-6 linoleic acid in meat, dairy, eggs, vegetable oils). Q.If we get too much omega-6 in our diet, then why do you offer products that contain an omega-6? A.Omega-6 fatty acids (LA or Linoleic Acid) are found mainly in corn, soybean, safflower, and sunflower oils and, although essential, these fatty acids are over consumed and out of balance with omega-3 fatty acids in the modern food supply. For these reasons, omega-6 supplementation is not needed for non-strict-vegan westerners. However, there is one type of omega-6 (named GLA or Gamma Linolenic Acid) that does require supplementation. GLA is found in few sources such as borage and evening primrose oils. GLA promotes the production of beneficial prostaglandins, supports healthy skin, brain function, mood, joints and cardiovascular health, and works best when taken along with the EPA and DHA in fish oil.